Craig Hispon, Managing Director, Dive Kapiti was fortunate to get up close as the Orcas made their way past Kapiti. The following was in the Kapiti News today. Local residents were quick to share video footage and photographs of orca whales who visited the coastal stretch between Wellington and Kapiti last week. Among them was Karl Webber, who captured close-up footage of two orcas just off Tokomapuna Island, located between Kapiti Island and the mainland, which gathered over 1200 views online. “It looked like a small calf or juvenile being shown the ropes,” Mr Webber said. 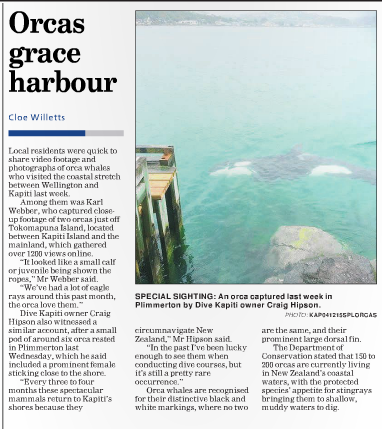 Dive Kapiti owner Craig Hipson also witnessed a similar account, after a small pod of around six orca rested in Plimmerton last Wednesday, which he said included a prominent female sticking close to the shore. “Every three to four months these spectacular mammals return to Kapiti’s shores because they circumnavigate New Zealand,” Mr Hipson said. Orca whales are recognised for their distinctive black and white markings, where no two are the same, and their prominent large dorsal fin. The Department of Conservation stated that 150 to 200 orcas are currently living in New Zealand’s coastal waters, with the protected species’ appetite for stingrays bringing them to shallow, muddy waters to dig.